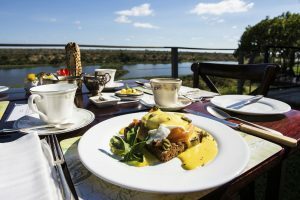 Buhala is an enchanting Game Lodge right on the banks of the Crocodile River, the border of the Kruger National Park. What a wonderful waterhole to have at the bottom of the garden! Elephant, buffalo, hippos and many antelope are just a few of the frequent visitors there. Guests sitting on the verandah sipping sundowners or lazing around the pool have wonderful sightings of these fascinating animals. Fine food and wines are served on the deck under candlelight and the whole atmosphere is one of casual elegance and great comfort and tranquility. Buhala is a marvelous place also, from which to explore the magical bushveld, which gives you the realization of true Africa. 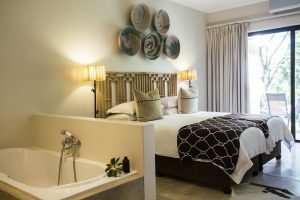 Luxurious accommodation is provided in ten elegant en suite double/twin rooms, each with full bath and separate shower, and is complemented by superb cuisine and a well-stocked wine cellar. 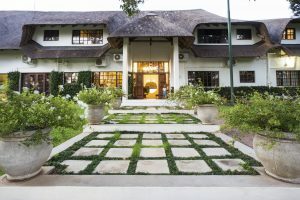 Buhala Game Lodge offers 6 x Standard rooms, 2 x Balcony rooms and 2 x Elephant garden suites. Air-Conditioning and Fans, En-suite bathrooms, separate shower and bath, Tea and Coffee tray, Heater and Safe. Enjoy some pampering at our open deck day spa which overlooks the Crocodile River and the Kruger National Park. Full body hot rock massages, back and neck massages, manicures, pedicures, foot treatments and facials. Superb international cuisine and an extensive wine bar. Cozy bar and lounge. 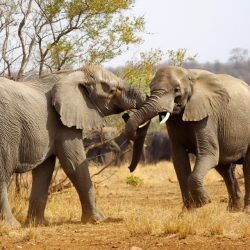 • Day safaris into the Kruger nearly always see at least 4 of the BIG FIVE. • “Bush Spa” on an outdoor deck for massages, pedicures, manicures etc.